The idea that the Seychelles are all about palm-lined beaches underplays the scale and diversity of this geologically rich group of islands. Unlike many other tropical paradise destinations, a beautiful seascape is only part of the picture for this gem of the Indian Ocean. From the 900 metre peak of Morne Seychellois to the forested National Park, the 115 granite and coral islands of the Seychelles are rich in flora, fauna and wildlife. The Seychelles are more than a luxury seafront. The board asked us to create a film that could represent the full breadth of the Seychelles and differentiate it from other destinations. The brief was to create a film to very high production values that could be used for a variety of media including large-scale projection at trade events and use as an advertising piece online, on television and potentially at the cinema. To reflect the beauty of the islands, the quality of the finished production was critical. 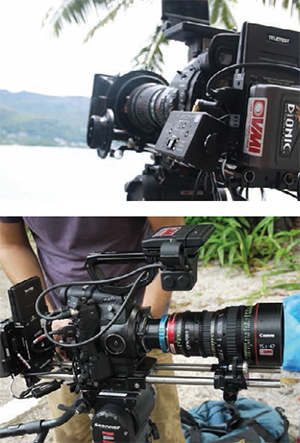 In consultation with London-based camera hire specialists VMI, Gold selected Canons C300 as principal camera. The system delivers excellent pictures, records to a codec that transcodes perfectly for Final Cut Pro to create an effective post-production workflow and is small and light enough to be carried for a whole day traversing mountain trails. Further consideration was given whether to use the PL or EOS version but they decided on the PL version to enable the team to use the best lenses available. As we were planning to add matte boxes, lens trays, large lenses, wireless transmitters for the monitor and lens control, plus high-capacity batteries, it was important that the camera itself was not too heavy. The C300 fitted the bill perfectly. Continues Gold. RGM has worked with some of the worlds most successful brands including Apple, British Airways, Heesen Yachts, Tottenham Hotspur, Coutts Bank and Abu Dhabi Tourism. Consequently, despite the distances involved and practical challenges they would face, the crew understood that there could be no compromise in the kit selected. A case in point were the batteries. Gold remarks: By using the Anton/Bauer Dionic 90, we could shoot for a whole day on a single unit - very impressive. And we had no problem taking a number of the units with us on the plane. Durable, reliable and compact, they certainly fitted the bill. We were also impressed with the new wireless Teletest Telesend monitor which allowed us to monitor the camera even when the DOP was perched halfway up a cliff. Its strictly line of sight so it took us a while to get used to the system but we found this extremely useful. The monitor is easily good enough to check for overexposure and focus accuracy; most importantly, it let us check that the shot was properly framed and watch the play back from the bottom of the cliff. With the Steadicam, it really came into its own, allowing us to remotely focus the camera from a distance. Compared with older wireless systems weve used, its much lighter and the round-the-neck director monitor design is an excellent and robust design. 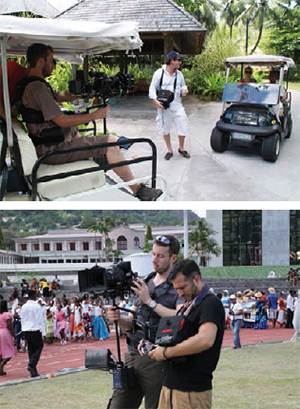 Shooting Wireless in the Seychelles The production was the first to use Canons new range of Cinema Zoom lenses, bought in for the production especially by VMI. According to Gold, the 15.5-47 and 30-105 both performed to a very high level, with the pictures matching well with footage shot with Cooke S4 Primes. Shooting in rugged terrain over the course of a whole day, a versatile T2.8 zoom is great news. It meant that we could shoot more quickly and travel light and with the production lasting 32 days having to carry less equipment makes a big difference. Each lens and lens set comes in a metal flight case. Then when you include a tripod, Steadicam kit, mini jib, camera bags and batteries, the weight really adds up. If the crew get over-fatigued then injuries happen and so the importance of judging how much we could all carry by hand was a major concern. Adds the producer. The combination of the Canon camera and lenses coped exceptionally well with the harsh highlights at midday. The DOP found the cameras focus assist, neutral density and exposure zebras invaluable on the C300PL. In the full glare of the equatorial sunlight, it can be difficult to monitor and set up a shot even with the brightest screen, so the extra functionality that the C300PL offers made a huge difference. Remarks Gold. Despite the cinematic ambition of the producer and client, prospect of filming in 4K was never seriously considered. The reality, he concludes, is that the HD produced by the C300 and the Canon lenses is exceptionally high quality. Plus, even as a 1080 project, we amassed as much as 1.5TB data during the whole shoot; the thought of having to transcode, store, edit and re-purpose the same number of hours in 4K is a terrifying prospect on many levels, let alone backing up all your rushes onto three drives every day. By sticking with HD and the C300, we were able to invest in areas we wanted to, such as hiring the highest quality lenses.